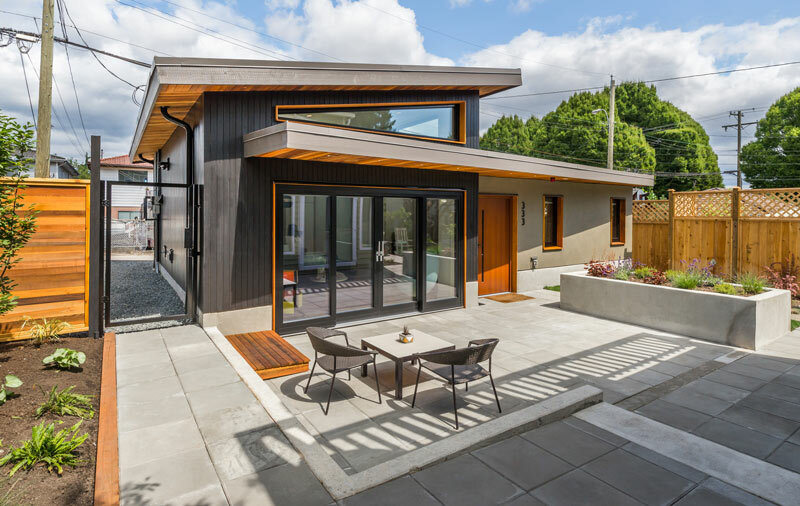 The Vancouver Modern Home Tour is Happening Today, Sept 15th! But you can still get tickets - here's how! 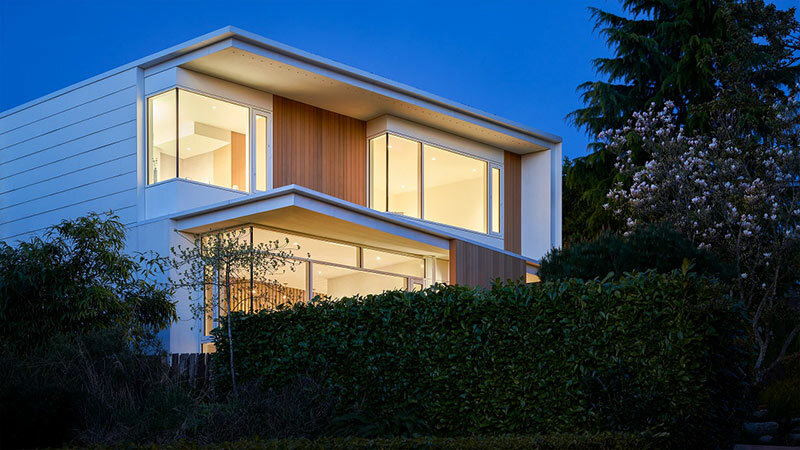 Join us on September 15th as we get up close and personal with the architects, designers and homeowners that define Modern in Vancouver, BC. Here's how it works. 1) Purchase your tickets 2) About 48 hours before the Tour, you'll receive a printable map via email 3) On Tour day, visit the homes (in any order and at your own pace) and enjoy the day supporting local architecture & design! 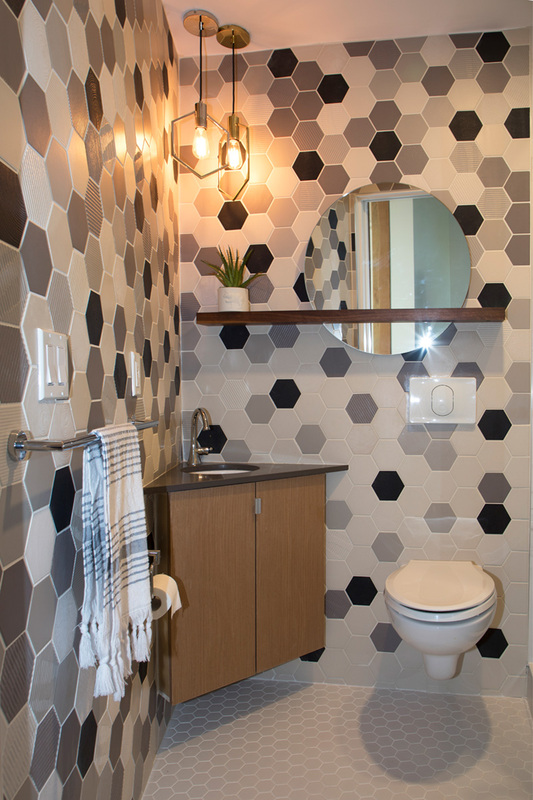 Presented by Synthesis Design Inc.
SeaChange is a property development company that seeks to transform the way people think about sustainability. For us, sustainability is not limited to individual criteria; a home is not sustainable simply because it is environmentally sensitive or energy efficient. We appreciate both, but our outlook is more comprehensive. Our homes are beautiful, livable, and healthy. Built for their inhabitants and the communities they exist within. Because to us, true sustainability is not a points-based enterprise. It is about creating homes that are relevant, responsive, and well-designed—both technically and aesthetically. It’s about making homes that people want to live in. And in doing so, they are able to live in a way that is better for the environment, their community, and their personal well-being. SeaChange believes architecture can be world-changing, and we recognize that, in many ways, it needs to be. Currently, the world of property development too often relies on cheap materials sourced from far-flung places without regulations to protect human lives or natural environments. It also frequently involves marginal architecture that fails to fulfill our human need for intimacy and domesticity. As a result, these homes are disposable; an alarming waste of resources. We want to do better. To accomplish our aim, we invest more into the design and construction of our homes than the typical developer. At SeaChange, we care about the provenance of things: where things come from and how they were made. For that reason, we emphasize local resources and artistry—not only because they are more environmentally sustainable, but also because we appreciate their quality. The emphasis on locality also influences the unique design of each property. The relationship between landscape, architecture, and interior create a distinct, holistic experience for homeowners. 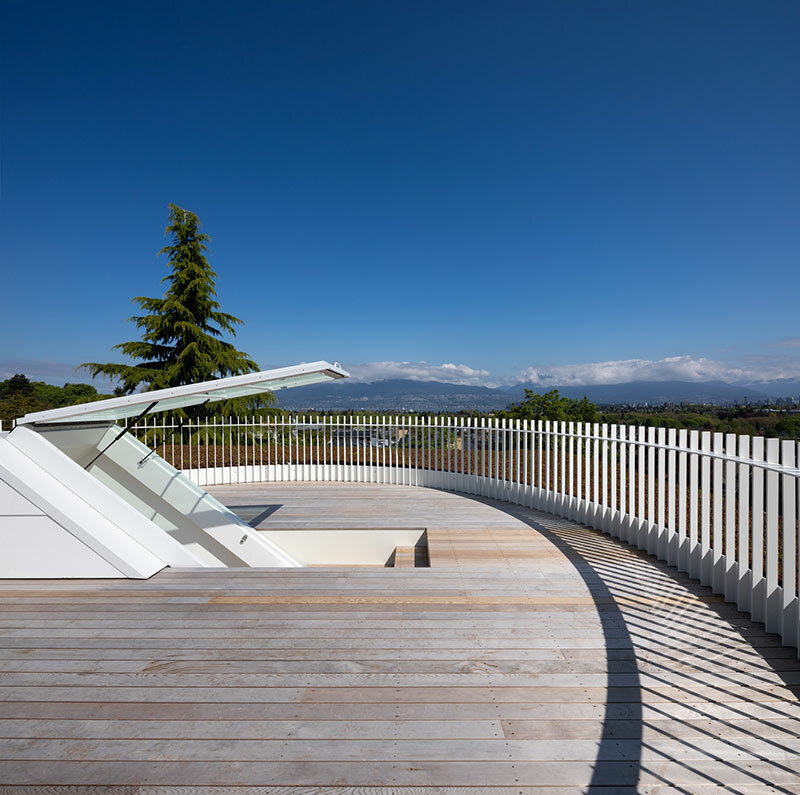 Our structures do not merely reflect the beauty of its surrounding topography but become a part of it. As we consider the history and source of each material used, so too, our designs thoughtfully address the future environmental impacts of our homes. Striving for self-reliance, we implement measures such as solar arrays and water management systems to reduce our homes’ consumption of non-renewable and municipal resources. Small differences to inspire significant change. 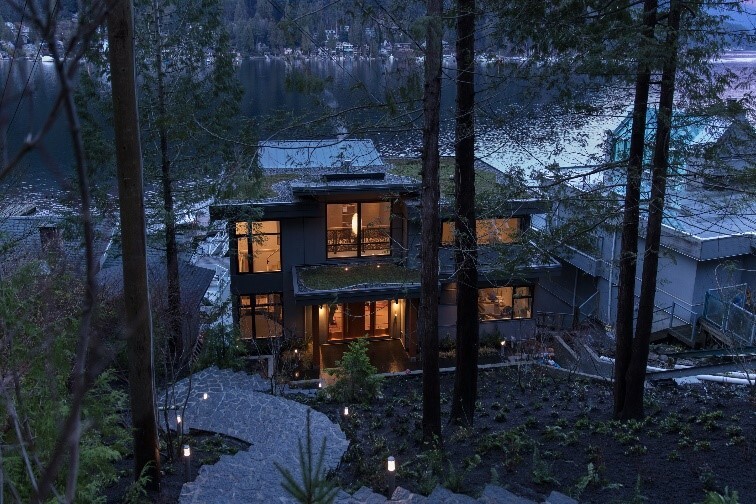 Interior Design: Synthesis Design Inc.
Nestled in the heart of Deep Cove, perched on the edge of a 100 foot embankment sits a simple, modern 2-story waterfront structure. On approach one may assume it is the front of the house. It is not. This is the “garage with a view”. Hanging below the garage is the studio with some of the best outlooks of the site.From here one can take the 64 handcrafted serpentine stone stairs or the funicular down 80 feet to the main dwelling. The walk (or ride) reveals the waterfront home below, first with the green roofs which blend into the natural landscape and are designed to mimic golf greens. 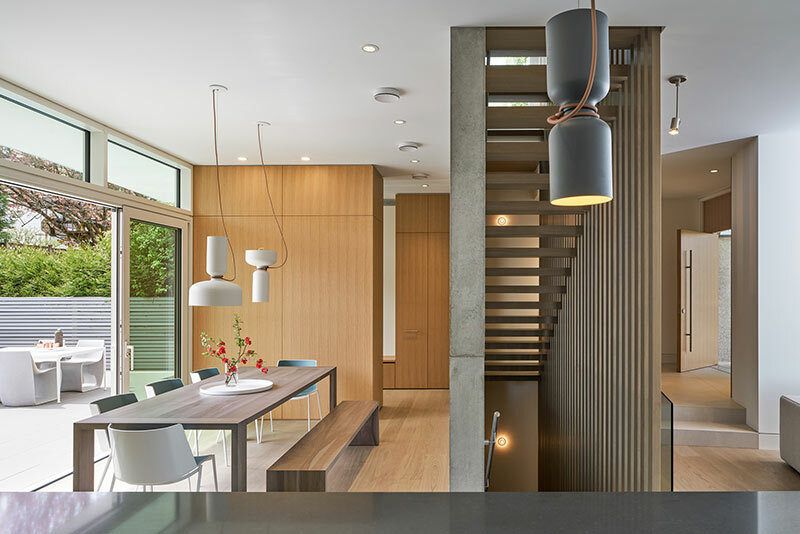 This modern home visually welcomes its visitors with a large glass stair core and an oversized simple wood pivot door. Inside the foyer gives one glimpses of the view beyond but is obscured by the featured stone fireplace. The main level is an open plan with large sliding doors accessing the living and eating deck with high ceilings and exposed structure. 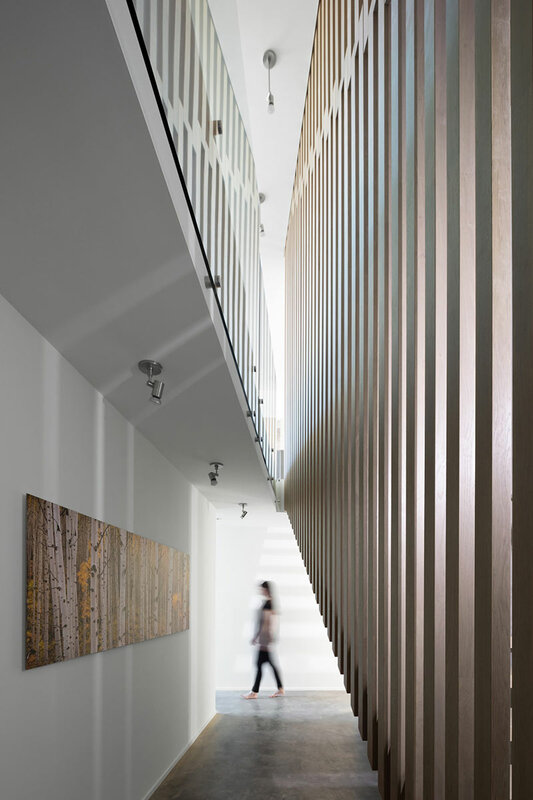 The feature stair core allows natural light to spill into the home through custom designed rusted metal railings, leading one up the bedrooms and down to the custom golf simulator room. 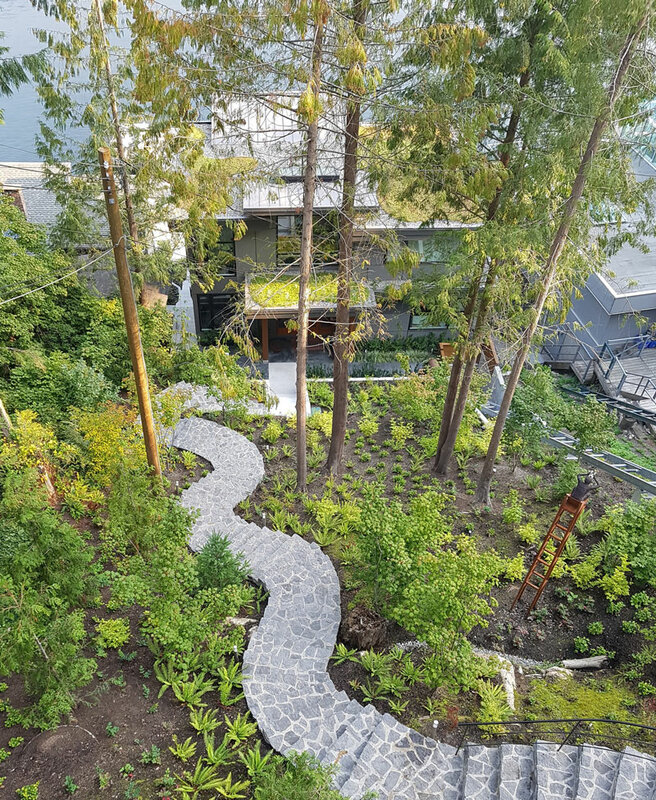 Access to the water is through a transition of spaces that leads to the stone walkway, the dock and the waters that are Deep Cove. 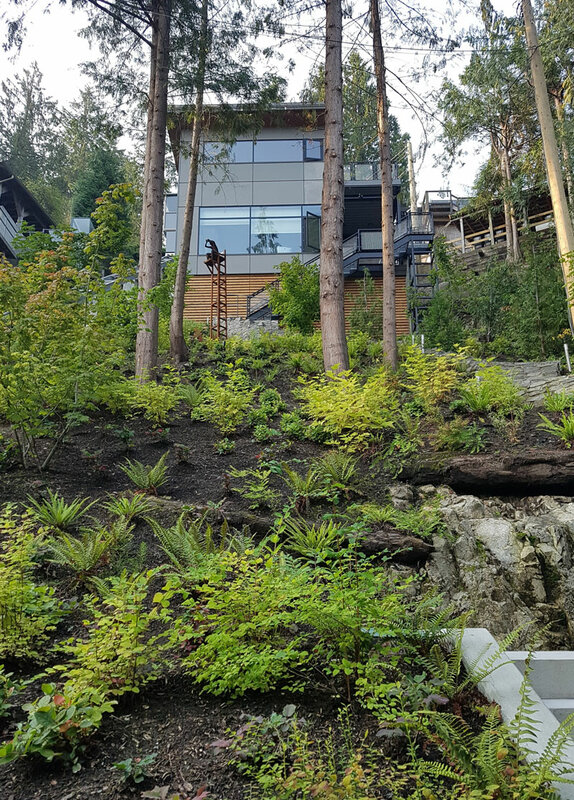 This home may dominate nature from its various view spaces and decks throughout the 100 foot slope, but as one experiences the natural procession throughout this spectacular steep sloped site, it evokes a strong sense of harmony. A stunningly sophisticated, fully renovated West Vancouver penthouse in the heart of Hollyburn. This 1,555 sq ft of simplistic, contemporary living features soaring two story vaulted ceilings in the living and dining room, open floor plan, a clean sculptural wood burning fireplace that blends into the wall, modern flush baseboards and a gourmet kitchen. 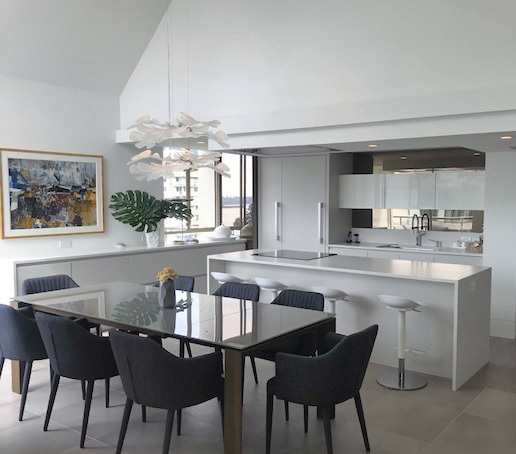 This entertainment kitchen features built in appliances, a hood fan recessed into the ceiling allowing unobstructed views, a large central island with space for stools and a wet bar complete with a bar fridge. 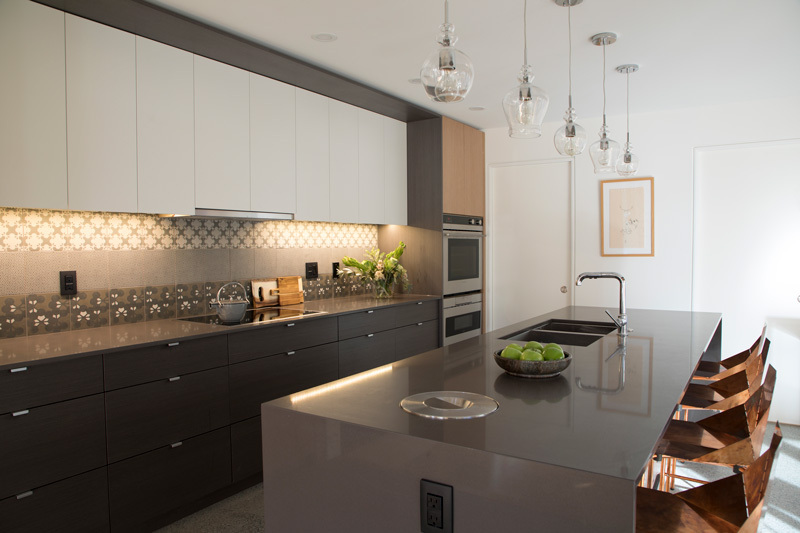 Storage was at the forefront of the client’s and the designer’s mind when renovating this space. Not a corner has been left unexplored. A concealed pull out shoe rack below the lower staircase, a hidden linen closet in the upstairs foyer, a laundry closet that looks like a custom armoire and mirrored medicine cabinets in both three piece washrooms. The master bedroom features a unique built in bed with a wall cabinet acting as both a walk in closet and headboard. 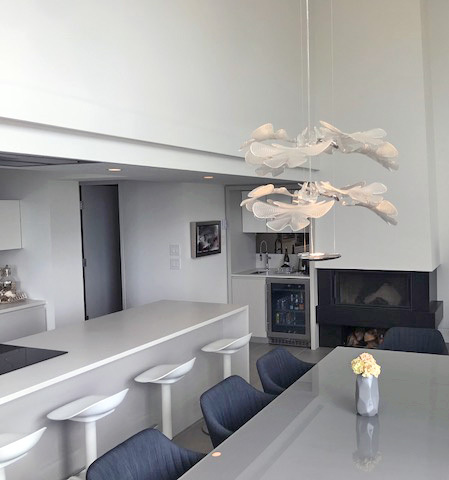 An Italian glass dining fixture , a large cloud-like pendant in the stairwell and led pot lighting throughout create beautiful lightscapes and enhance the sculptural quality of the architecture. Three decks maximize the amazing views of the harbour, Stanley park and UBC. Location! Lifestyle! Walking distance to all the restaurants and shops of Marine drive and Ambleside park makes for a great life-style. 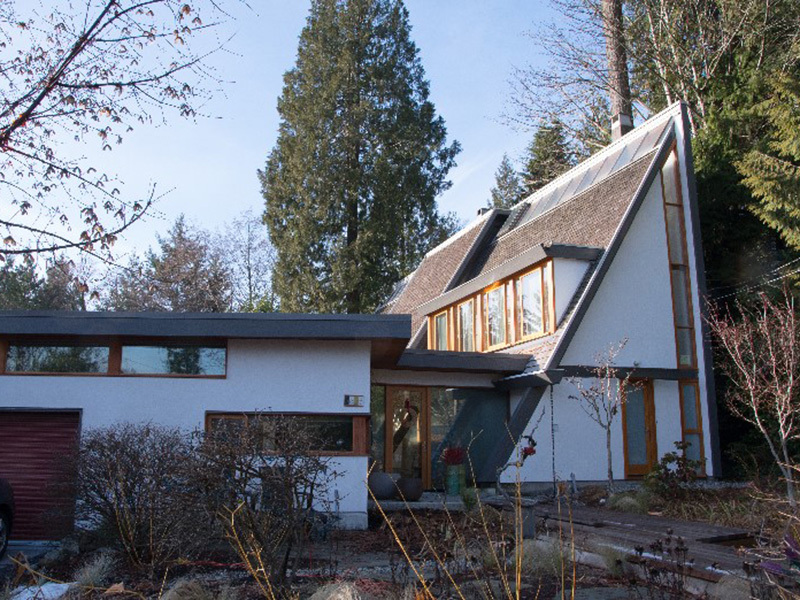 Known to neighbours as ‘the Wedge House,’ this unusual home in Edgemont Village is officially known on North Vancouver District’s Modern Heritage Register as the Mitchell House, referring to the original owners. The home was designed by Arthur Erickson and built by an unnamed Japanese shipbuilder in 1965. The current (and fourth) owners have lived in the home for eighteen years. Small improvements and restorations were made over the years, but mostly the house remained unchanged from the original. 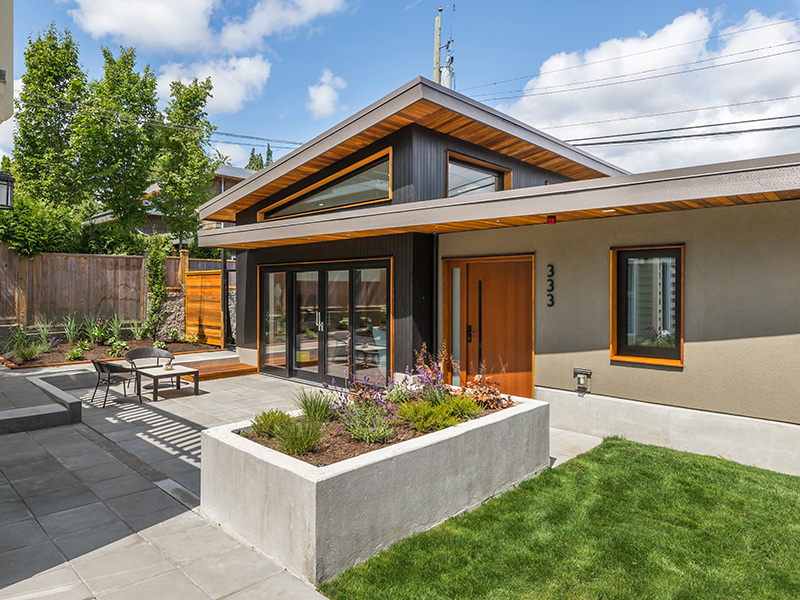 In 2014 the owners approached Lanefab Design/Build about an addition to the original 1600 square foot home. 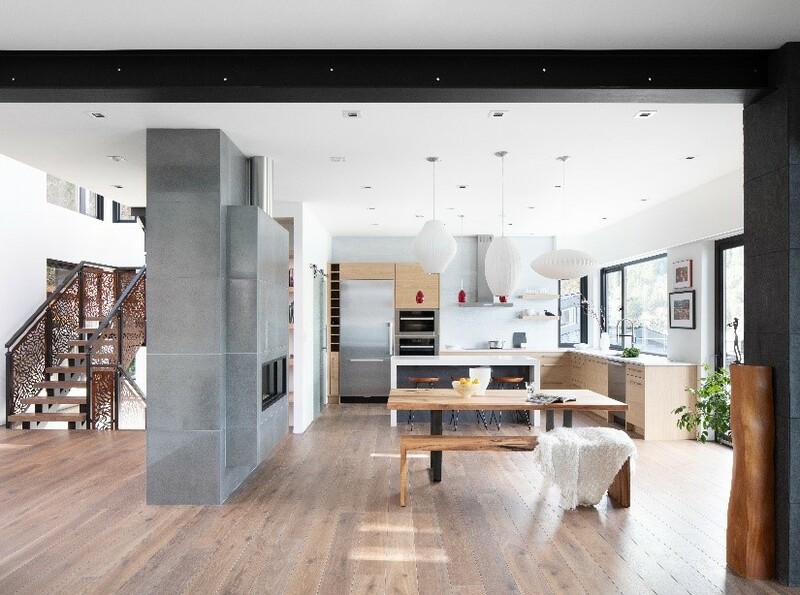 LEED-accredited designer Bryn Davidson proposed a unique solution to add space while preserving the sightlines of the original post-and-beam architecture and creating a protected courtyard out back. The project was completed in the summer of 2017. 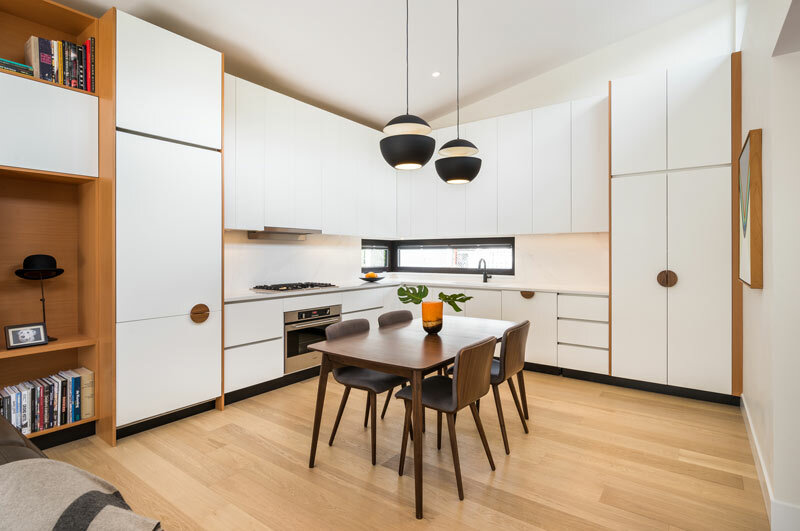 In the original ‘wedge’ structure, some thoughtful changes were made to the interior, particularly a large new kitchen in the space previously occupied by the dining area and galley kitchen. The addition provides a large new dining room, den and bathroom, garage, side entry, and dramatic new front entry. 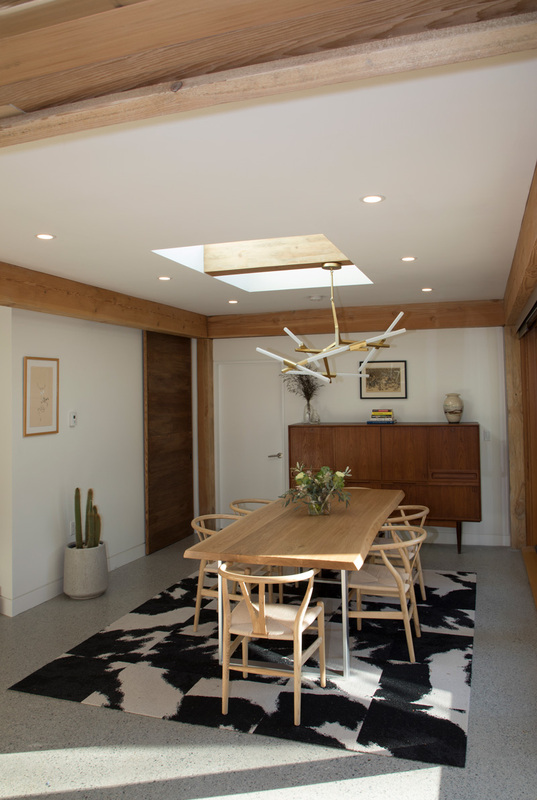 Original elements were incorporated into the new structure, including re-use of a Douglas fir beam and mahogany/teak cabinetry that had to be removed. 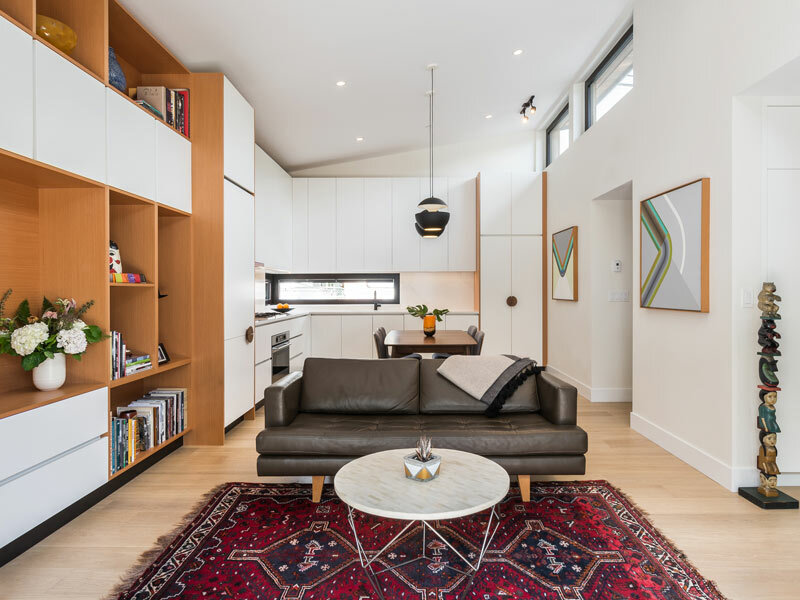 The style of this modern laneway house is in stark contrast to the property’s main home which was built in 1906 and owned by the family since 1953. But rather than build a home to match the original, the property owners decided the new building should reflect the current time and their personal esthetic. 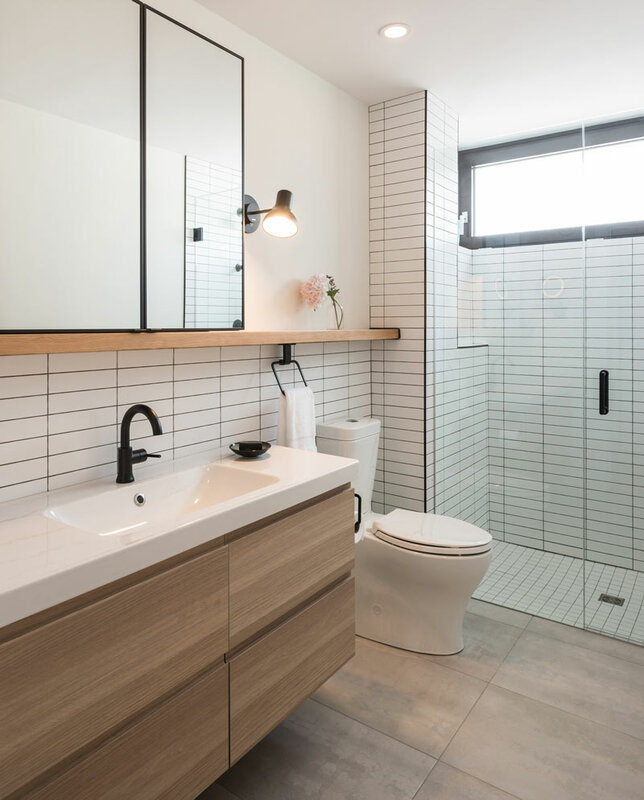 While designing the 900 sqft, 2 bedroom, 2 bath lane house with Bryn Davidson and his team at Lanefab, the owners realized its one level layout and ample storage space was what they were looking for in a retirement home. 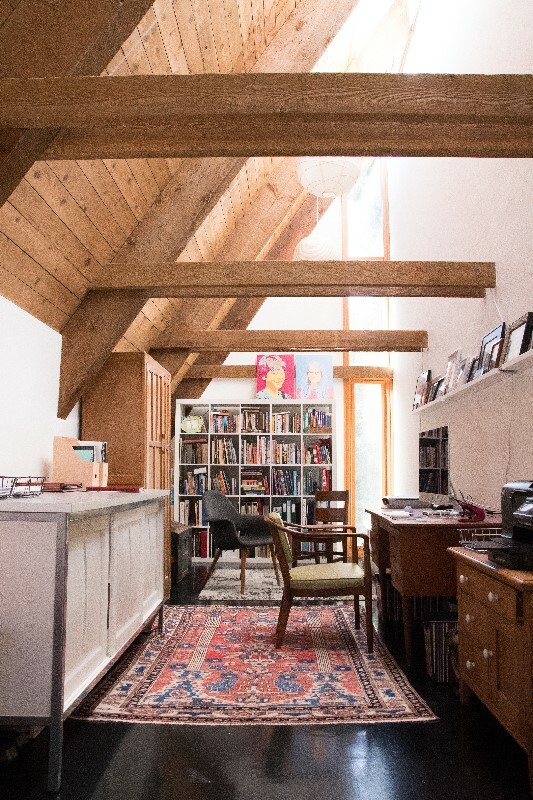 They switched mindsets and instead of thinking of it as an income suite they began building it for themselves adding blank walls, art lighting and a shelving unit to display pieces from their art collection. 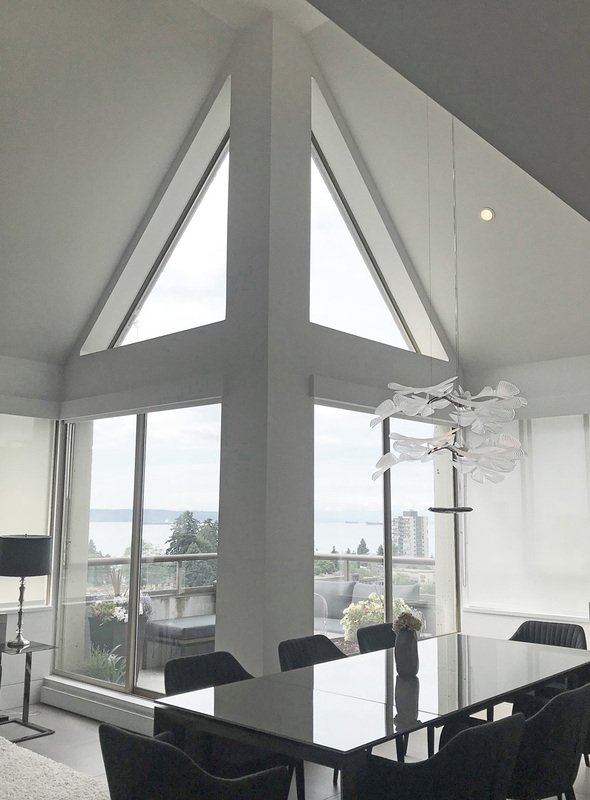 Clerestory windows bring in light and passive heat to the vaulted living and dining area and Vetta lift and slide patio doors open the main room to the garden without consuming valuable floor space. All this adds a sense of spaciousness to the home in spite of its remarkably small footprint.